With our 100% wool inserts pushing the pad up into the gullet of your saddle can be a challenge until it gets broken in through use. To make correct positioning of the saddle pad contour easier, you can push the pad up from the side. Do this BEFORE you cinch and do it equally on both sides of the pad. If you remove your liner from your pad, be sure to REALIGN the VELCRO CAREFULLY so that it matches up all along the spine. It is more important that the liner be velcroed in evenly from side to side than for the vent holes to line up perfectly. For the best results using your CSI Saddle Pad we HIGHLY RECOMMEND you watch the video below as well as visit our our Saddlepad Fit page for more in depth information on saddle pad fit. • Our 100% all natural wool liner are just that — 100% all natural and the bits of vegatative matter in the material are what was on the sheep when it was sheared of its fleece. Since we used needled wool instead of pressed wool, the wool never goes through harsh cleaning processes, so the vegatative matter remains in the finished product. Simply pluck it out. • You will need to replace your CSI liner every one to three years depending upon how much you ride and how often you clean them. Keeping your liner clean and following the care instructions on this site will help your pad last longer. Please read and follow the instructions carefully. 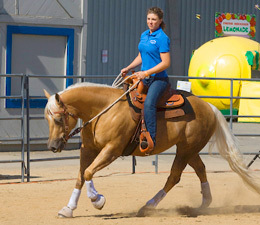 Be careful not to position the saddle too far forward on the pad or the saddle & pad too far forward on the horse. A general rule that works for many saddles is to make sure the pad is positioned so that the back of the saddle skirt and the back of the CSI Saddle Pad line up or are close to lining up. Watch more saddling and saddle fit videos in our Video Library. • Choose a saddle for your horse that fits well. Tree width, rigging position and overall length all impact fit. • Your cinch should hang straight down from the rigging of your saddle. It should not slant forward or backward even after you’ve ridden the horse. • A longer wider cinch will make for a more stable and comfortable saddle. Your cinch should have between 3 and 6 inches of latigo between the rigging of your saddle and the cinch D ring. • Be sure to brush your horse well before saddling to help extend the life of your CSI liner.